X-Anatomy™ is a cross-sectional human anatomy and medical imaging atlas developed by Dr. Francis Isidoro for the iOS platform. 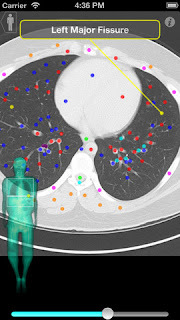 This application has annotated, zoomable CT images of different body areas (head, chest, pelvis, etc) that are commonly encountered in clinical practice. X-Anatomy is an excellent point of care resource for non-radiologists that review CT and MRI images. This app is appropriate for medical students, residents, and attending physicians. Advanced practice nurses and students will also find this a useful app. A particularly useful feature is the ability to select and follow that structure through the other images for that body area. This allows you to trace blood vessels, ribs, and other structures and develop a better understanding of the pathway the structures take through the studied body region. The X-Anatomy video illustrates this feature. I have found this application extremely useful when going over CT scan results with my patient. The ability to track an organ through a series of slices is the most useful function. Thanks.